The Phoenix Zoo’s reputation as one of nation’s top five zoos for kids is well-deserved. For example, its dedicated Children’s Trail places the youngsters in the thick of emus, ocelots, and golden-mantled tamarins before concluding with a petting zoo and child-oriented agricultural programs. Clearwing Productions called on Technomad to provide a long-lasting outdoor audio solution, along with the full-range, broadly dispersed musical audio reproduction the ZooLights exhibit desperately needed. However, the Phoenix Zoo goes out of its way to entertain all ages. This is especially evident with ZooLights, an immersive, 360-degree audio and lighting experience that encircles the zoo’s central water lagoon. For concert lovers, it’s about as close as a zoo comes to a rock and roll spectacle. Enter Clearwing Productions, the Phoenix-based systems design and integration firm that excels in synchronized audio and lighting systems, among other specialties. What began as a simple lighting upgrade quickly progressed into a comprehensive audio and lighting overhaul that also found Clearwing in the show producer and lighting designer roles. Specifically, the center sphere in the lagoon is surrounded by a dozen 12-foot pylons converted in Color Kinetics iColor Flex MX LED strings. Each of the 4,320 LEDs on the display is individually controlled, supporting a wide variety of lighting looks, speedy transitions, and mesmerizing reflections on the lake surface. 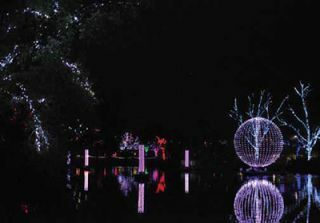 Surrounding the lagoon are trees wrapped in different colored LED strings and custom armatures, immersing the guests with the effect of moving, chasing, and dynamically dancing trees. A 30-universe ETC Mosaic Show Controller system further enhances moods and settings, such as dimming architectural lights at the start of each show. The Mosaic system also controls a Pharos Audio Visual Controller to synchronize the lighting and music programs. “We installed the components in an air-conditioned, outdoor rated rack enclosure that encompassed a custom-built touchscreen to support the different control features,” said Pitman. Outdoor protection again came to the forefront in phase two, when Clearwing was hired to enhance the audio system. The team called on Technomad to provide a long-lasting outdoor audio solution, along with the full-range, broadly dispersed musical audio reproduction the exhibit desperately needed. Furthermore, the Clearwing team had the challenge of finding an all-in- one solution to simplify audio connectivity around the lagoon. The thought of running wires underwater from shore to shore to connect indoor amplifiers and outdoor loudspeakers was not pleasant to anyone. The Clearwing team had quickly decided to use Technomad advanced audio loudspeakers and subwoofers to fulfill the quality and protection requirements. A total of 24 Paris loudspeakers were positioned across 12 poles surrounding the lagoon, along with 12 Chicago subwoofers. Two Paris loudspeakers on each pole point in opposite directions, with one subwoofer providing additional bass response on each pole.